Children often know how to turn our frowns into smiles. They know how to make us laugh and how to cheer us up at any given time. This is why it is important to have a day dedicated to learning about keeping children safe and healthy and allowing them to do what they do best—which is just being a kid. Monday, Oct. 7 is Child Health Day. At Wheels For Wishes, children are so important to us, and we do our best to see that we can help Make-A-Wish grant the wishes of kids with critical illnesses. At Wheels For Wishes, benefiting Make-A-Wish, people are able to donate their unwanted cars which will be recycled or reused and transformed into wishes for local kids. We love that we are able to help Make-A-Wish and contribute to their amazing work of helping local children, but we need people like you to help make it happen. Steps need to be taken daily in order to keep a healthy child, but Child Health Day is an excellent day to learn about child health and get started on living a healthier lifestyle if you haven’t already. Use Child Health Day as day one of your healthy lifestyle, and start to practice healthy options every day of the year. 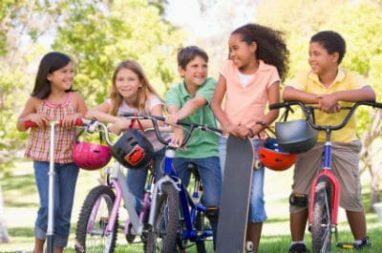 According to the Centers for Disease Control and Prevention (CDC), children and adolescents need an hour or more of physical activity each day. Adults need at least 2 ½ hours of moderate-intensity aerobic activity every week, plus muscle-strengthening activities. Breaking up exercises to ten minutes at a time is helpful for busy adults. Try taking three ten-minute walks per day, five days per week. Kids can get most of their exercise through aerobic activity, whether they are walking, running, jogging, biking, skateboarding, etc. Aerobic activity should be done at least three days per week, and muscle strengthening should also take place at least three days per week. This could include gymnastics or push-ups, so make sure you take your kids to the park to play on those monkey bars! Bone strengthening is also a necessary part of your child’s hour of physical activity per day. This could include running or jumping rope, but a combination of aerobic activity, muscle strengthening, and bone strengthening is best! We all know that fruits and vegetables are important and we need to include them in our daily diets. To calculate how many fruits and vegetables you or your children need, use the CDC’s fruit and vegetable calculator. Simply fill out your age, gender, and your daily amount of physical activity. Each year, make sure your kids have their yearly physical to make sure they are caught up on immunizations and to help them from getting sick, and also make sure they attend their routine dentist and eye doctor appointments. For doctor’s appointments or the sake of an emergency, always keep a list of medical records and medications handy. This way, you are prepared in case of an emergency and know which medications to avoid in case of an allergic reaction. Many kids struggle with critical illnesses and are unable to live the normal lives that we or our children do. To help these children on Child Health Day, consider donating a car to Wheels For Wishes, benefiting Make-A-Wish. Your donated car can help bring hope, strength, and joy back into the life of a child with a critical illness. Your donated vehicle can help grant the wish of a child who needs it. Often times, the feeling of having a wish granted can be just what a child needs. Your donation truly makes a difference in the life of a child as well as their families. To donate a vehicle to Wheels For Wishes and to help grant wishes for kids in your community, please call 1-877-431-9474 or fill out our online vehicle donation form. Your donation can help provide a local child with a magical wish experience, while also helping to bring hope, strength, and joy back into their lives.